Here in Turkey it is clearly a lot warmer than the Netherlands. You notice the sun power during the jobs in the summer; the iron tools lying in the sun are real hot in seconds. You cannot hold them. One of the jobs I did was building a swimming pool. In the summer, during sunny days the water temperature became more then 30 Celsius. The water evaporates sometimes a centimeter per day. How can you prove that there is no leak? Internet research yielded a number of formulas for calculating evaporation. One of the components to calculate is global (heat) radiation. That can be measured with a pyranometer. Some time they call it solar radiation. But I had no possibilities to expand my weather station. I found an affordable (12 bit A / D converter via USB) by the company Conrad. They had also a component containing an amplifier and a diode that did broadband metering (300-1100nm) and the amount of light translated in to linearly voltage. en the material arrived the project good be started! Firstly, I have studied the programming language C. I did want to write a program in C because the drivers and examples were written in the language C.
I’ll downloaded “Pelles C for Windows" from the web. Pelles C is a fairly simple development environment for the programming language C. After a couple of evenings tinkering I had create a little useful program that opened every 2 minutes the A/D converter via a virtual serial port and wrote the data to a comma delimited file with the date and time of the measurement. Now it was time to do some tinkering with the hardware. First, I connected the unused ports from the A/D converter to the null. I'll terminate Port 1 with a 10 K ohm resistor; this was according the specifications of the light/voltage converter TSL250. Another bit of work to feed the TSL250 with 5 volt from the converter. This is the 5 volts from the USB port and maybe I will change it later to protect my USB port. After some more experimentation I decided to continue with the TSL250 because it did not required any external component. This worked reasonably well and it gave readings, only the values responded very much on the sun position. If the sun was directly above the assembly it gave very high readings. Some work needed to be done to make the sensor less direction sensitive. First I'll tried a transparent "roof" above the little hole, but it was not very satisfactory. On taster trip for material I came across a large glass "diamond" mend as adornment to hang a light fittings and other stuff. 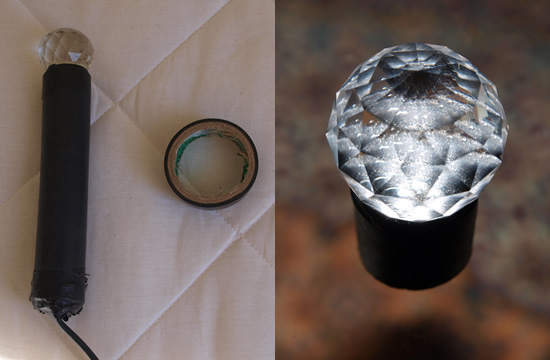 I did cut the bottom surface from this diamond and glued it with clear 2 component glue on the cap with the hole. The result was, that when the light fall on the side of this diamond, the readings where almost the same as light from above. Everything back in place for a longer test, but unfortunately the "diamond" still gave a huge gain in a small area (when the sun stood at its highest point). The result was a lovely total measurement till the high sun position and then the values were absurd. I'll did many experiments. I flattened the diamond slightly on top and gave it a matt finish. A small cap (hat) on top made of tin. Top painted with black matt paint. Etc. By coincident I found out that if you completely turn the assy with the "diamond" hung at the bottom, it gave much better results. Thus, after a few days running and produce measured values only the angle of the sensor is tilted slightly to avoid that the sun can stand 100% strait above the sensor. 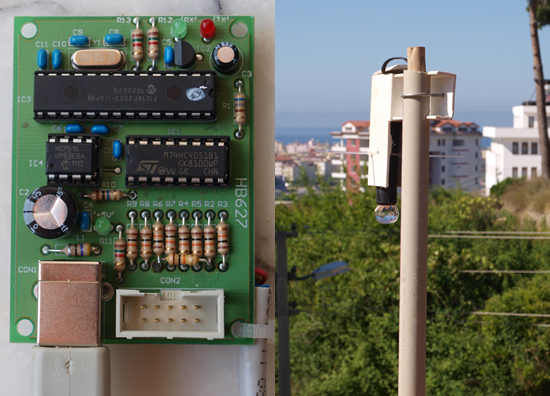 Now the sensor is mounted on the roof on a pipe and a FTP cable runs to the A/D converter who is connected to a stripped down laptop where all weather measurements are done. The pyrano sensor is clamped in a holder produced from a part of an armrest of a broken plastic lawn chair. This makes the sensor less hot in full sun, which prevents measurement errors due to high temperatures. There has been a few adjustments made to the little C program. There's a value available that I can enter as a multiplication factor to correct the readings. Therefore, there's no need to do it in Graph Weather software that is producing my graphs. The glass "diamond" and the whole sensor. To get some impression of the size, there is a roll of tape next to it. Here the 12 bit A/D converter with USB connection. The right cable on the converter goes to the sensor. The right photo shows the arrangement of the sensor on the roof. Moreover the program writes an extra column in the CSV file that I use for the number of hours of sunshine per day. Each measurement above 130 W/M ² in a interval of 2 minutes will write a value of 0,4 in that column per 5 minutes it has a sum of 1 that means there was 1/12 hours of sunshine. At dark, the sensor give at times some "noise" the program now truncate values below 15 to prevent this. In Graph Weather program, the first resource is used as input for the weather station. It is reading a historical file written by WUHU software in ws3600 format. Graph Weather produces beautiful graphs with this data. The templates of Graph Weather are written in XML and with a little effort these are easy to adjust. The second resource is the above-described CSV file. A solar radiation probe does exist in GraphWeater software and is not a problem. The date format produced by the program is now adjusted so that Graph Weather can read it. Sunshine probe is unfortunately not available, I have used relative rain_1 probe and the result divided by 12. The template is adjusted accordingly and it does works well. WUHU, Graph Weather and my program “glora” are running on an old laptop with a stripped down XP. Every morning the collected data is written to a NAS as backup. The Laptop is hidden on one site of the computer desk. It is remote controlled and running as a kind of weather hub. Here the graphs produced by this pyranometer .